(SitNews)- NOAA Ship Rainier has begun a month long survey of the sea floor near Alaska’s Prince of Wales Island as part of a multi-year effort to update nautical charts for the area. In addition to supporting marine navigation, data acquired by the 231-foot hydrographic survey vessel will also support marine ecosystem studies and improve inundation models for areas vulnerable to tsunamis. “We are pleased to return to Alaska to continue these important surveys, which will ensure the safe navigation of mariners who rely on the area’s waters for fishing, cargo delivery and recreational uses,” said NOAA Corps Capt. Donald Haines, commanding officer of NOAA Ship Rainier and the ship’s chief scientist. NOAA’s survey effort in the area began in 2006 with the Gulf of Esquilbel and has continued south over recent years. Rainier’s sophisticated sonar systems enable precise measurement of ocean depth and the creation of 3-D digital terrain models of the sea floor that reveals details about the underwater landscape and potential hazards to navigation. The first surveys of the area took place in the early 1900s. Depths were acquired with lead lines, a method that was accurate at the point of the sounding, but lacked information about the surrounding area. 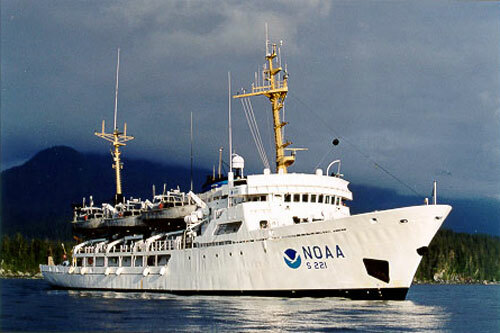 Commissioned in 1968, Rainier is one of three ships in the NOAA fleet that conduct hydrographic surveys in support of the nautical charting mission of NOAA’s Office of Coast Survey. Rainier last visited the area in 2009 before undergoing a year-long, $13.1-million major repair period during which the ship was outfitted with state-of-the-art equipment to conduct its survey missions with even greater efficiency and accuracy. Equipped with five 29-foot survey boats and high precision sonar and positioning equipment, Rainier is one of the most productive survey platforms of its type in the world. Rainier’s crew of 50 is comprised of NOAA Corps officers and civilian wage mariners, both licensed and unlicensed. The ship typically operates eight to nine months of the year in the coastal waters of Alaska and the Pacific Northwest. Homeported in Newport, Ore., Rainier is part of the NOAA fleet of ships and aircraft operated, managed and maintained by NOAA's Office of Marine and Aviation Operations, which includes civilians as well as commissioned officers of the NOAA Corps, one of the seven uniformed services of the United States. NOAA’s Office of Coast Survey, originally formed by President Thomas Jefferson in 1807, updates the nation’s nautical charts, surveys the coastal seafloor, responds to maritime emergencies and searches for underwater obstructions and wreckage that pose a danger to navigation.